Yes, it's good seeing the front page of MAMEworld up and active again, although no one can begrudge a man his honeymoon. Welcome back, KC! 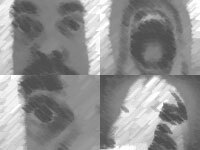 Looking to replace the screen snaps in your MAME front end with some actual movies? Check out Emumovies, a site devoted to replacing each and every lousy screen capture with glorious moving images! I hadn't visited Emumovies before, but I've got to say I'm impressed: they've even got movies for console games and hand helds! Take that old broken wedgehead EM pinball and turn into a modern electronic clock, with the score reels displaying the time! This isn't some simple hack, either: the units include a remote control to turn the display on/off, and can even be scheduled to turn on or off depending on the time of the day! You supply the pinball head, or pick from their selection. No, the review isn't blank, the control panel is! Looking to build your own ultimate panel, but don't want to do the woodworking? If you're like Paul Kiefert, you've probably seen the SlikStik Quad "blanks" for sale. Is it worth it, and can a blank control panel make a good foundation for your dream systgem? Check out the review and find out! ...or something like that. Actually, it's a "combo review" of a bunch of stuff: Happ Controls 49-way Joystick, Groovy Game Gear's GP-Wiz49, Mark Oates' 49-way Rotary Adapter, and Druin's Rotary Board Interface (personally, I like "Super Ultra-Mega Massive" better ;-) Anyway, it's now available over on the Reviews page. Don't like where certain keys are on your keyboard? Wouldn't you like to just pick up the key and move it to where it should be? Check out the DX1 Input System, a fully customizable keyboard with "smart keys" that can literally be moved around on the "board." I don't know how "MAME-friendly" this is, but I want one for Half-Life 2! No word yet on when it'll be ready or how much it'll cost, but if you're a big X-Arcade fan it might be worth looking into! Hot off the cyberpresses is my interview with Frank Leibly of StarROMs. The sole legal source of arcade ROMs, StarROMs has taken a supportive approach to the MAME community. Have they reaped the benefits of this approach, and what do they have in store for the future? Check out the interview to find out! according to the hilarious June 22nd, 2056 edition of The Onion. Absolutely hilarious reading. Yes, it's exactly as it looks: Pac-Man has been made into a guitar, specifically for Dave "Timely" Winer of the Howards and the Baltimores. It even has a headstock that blinks (no, it doesn't look like Blinky). Better yet, you can buy your own for a mere $5600. Thanks to Scott Peterson (no, not that Scott Peterson ;-) for the link! Wow, this last weekend was amazing: I received five reviews or interviews, with more due shortly! It's going to take a bit of time for me to go through them all and prep them for the site, but it looks like there will be a steady stream of new stuff on RetroBlast this week! How do I put this delicately...um, well, there's no way to say this other than I totally screwed up the initial review, and in a big way. I've just finished re-testing another TOKN16 encoder, and the results are, well, bad. Really, really bad. "OmigodIcan'tbelieveImissedthat" bad. I wish I had some great excuse for not catching the problems with this encoder the first time around, but it's a major screwup on my part, plain and simple. It's fixed now, and I apologize for the initial review. Direct from GameRoom Magazine is a review a book documenting the birth of the video game, written by the man who actually built the first video game system, Ralph Baer. What? Not Nolan Bushnell, the founder of Atari? That's just the first of the surprises in this fascinating book. Small Blue Robot Saves Universe from Retro Invasion! The New Trackballs are Here! Believe it or not, I just got delivery of the Happ trackballs for the roundup — the months of waiting are over! Pictured are the 4.5", 2.25", and 1.5" trackballs from Happs. The 4.5" ball is unbeliveably huge (actually, so is the entire assembly!) I'm getting a custom control panel "test bed" ready and will begin testing soon. Well, I was expecting the possibility of some heated reaction to my front page editorial, and I got it in spades (check out "RetroBlast is a Traitor" for the full blow-by-blow account). Strangely enough, I only got two emails about the editorial, both positive. Anyway, check out the "traitor" thread for my posting about what led to my position. I haven't "sold out," and I certainly hope I'm not a traitor to the "MAME cause." These are tough times for the community, and trust me, I've been thinking a lot about the future of MAME and retrogaming in general! I've got two reviews that I'm planning on revising soon: the TOKN16 encoder and the Wico leaf-switch joystick. Both of these "review re-do's" are due to feedback from the BYOAC forums. In the first case, I may have missed some serious drawbacks in the TOKN16 design, and in the second review, it appears that the used joystick I obtained for the review may not have been an "ideal candidate." In both cases it's definitely looking like the reviews were either too positive or too negative, and since my goal is "just right", I'll keep my fingers in the porridge and re-test new samples of both the encoder and the joystick. Until the testing is complete, I've pulled both reviews from the site. There's a new web site devoted to disability gaming: One-Switch Gaming "is especially interested in games playable with a single switch, and in campaigning for accessibility features in all games." The site includes the winners of the one-switch contest over at RetroRemakes, including remakes of games such as the grandaddy of all video games, Computer Space. More evidence that retrogaming (and MAME cab building) has gone "mainstream" — Happ Controls has a new "PC Arcade" section on their site, with a product selection tailored for the hobbyist who is building a PC-based arcade cab. Happ even has Saint's excellent Project Arcade: Build Your Own Arcade Machine book for sale! Yup, it was meant to be: here are some photos showing X-MAME .1 running on a Sony PSP. Only one game is working right now (Omega Fighter), but it's a start. and other bizarre coin operated machines developed by Tim Hunkin. The auto-frisk includes auto-inflating hands that "frisk" you, as well as some unique, ahem, 'surprises' in store for whoever tries it out. Be sure to also check out the "test your nerve" machine, complete with a drooling robo-dog. Or the machine that can analyze an auto-flipped coin to tell if it was heads or tails. And no, I am not making any of this up! Please join me in welcoming ArcadeGames4U, RetroBlast's latest advertiser. They've got an incredible variety of arcade cabinet styles to choose from, as well as arcade controls, parts, and accessories. They even have game room decorations! Well worth a look. The Star Wars Fan Club is having a contest, and the prize is a mint-in-the-box Star Wars Trilogy pinball machine. In their words: "Starting this Friday, June 10, and running through Monday, July 4th, you can make good use of your ticket stubs from Episode III Revenge of the Sith. Send them in to the Official Star Wars Fan Club to enter our See Star Wars Episode III Again Sweepstakes." I'm surprised they've got a mint condition 1997 pin still in the box! There's an article about the creation of RetroBlast! in the June issue of Gameroom magazine, written by yours truly. If you're curious about seeing a better shot of my gameroom, be sure and check it out. With all the recent controversy over the MAME name, I thought it was time for me to pay a visit again to the UltraCade site. I was surprised to find a redesigned site with a lot of new products, including some very interesting PC hardware for arcade gaming, like the USBLinx. A Jamma-based interface, the USBLinx supports up to 4 joysticks with 4 buttons each, 2 trackballs, and a spinner. It even has a watchdog circuit to reboot the PC system in case of lockup. Dream Arcades has now put up a web page for their new upright arcade cabinet, including special discounts for pre-orders until June 17th. It will be available both as a 'plain' cabinet and also bundled with a computer system. It's got some unique features, such as a "flip-out" monitor bezel, so be sure to check it out! I've just posted a "guest editorial" on the Retrogaming Articles page, an article entitled "Controlling the Classics!" from The Stinger Report, an amusement industry news journal. The article looks at the MAME / Utracade trademark fight from the industry's perspective. It's a good read, and worth checking out! Nintendo Promises Free Retro Classics! As an incentive for their upcoming Revolution console, Nintendo has already announced that the Revolution will ship with emulators for all of their previous consoles. Now they've announced that the retro-titles will be free. A breakthrough or a desperate gamble? This is a new high in lows: a pinball machine dedicated to the wonders of gastric distress. Several "Gas Attack" pinballs are part of the "Grossology" exhibit at the Fernbank Museum of Natural History. Players keep the ball in play by bouncing it off bumpers that represent foods that can cause gas. I don't know if this is a good or bad thing for pinball, but it's certainly unique! Thanks to James McGovern for the link! Now this is a cool combo: MAMEroom has just released control panel design software that can be used to design your own custom layout, which MAMEroom can then build for you! 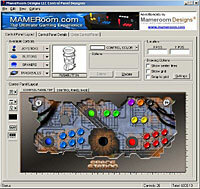 From the BYOAC Posting: "Mameroom Designs LLC has released the latest in control panel designing software. Design and layout your own customized control panel to build yourself or have us make a custom kit for you! MameRoom Designs LLC will soon be using this software to manufacture custom control panels completely assembled and ready to plug-and-play! Each panel will be custom made based on YOUR specifications!" Bob Seidel once again goes for twenty questions, this time with MAMEdev extraordinaire Haze. Find out such gems as what his favorite games are, his finest MAME accomplishment, and the stupidest question he's ever been asked. This is an exceptional inteview and a great look into the MAMEdev world, and is now available over on the Articles page. This year's classic gaming expo in the UK (CGEUK) is teaming up with Twin Galaxies to accept new videogame and pinball records. To quote the press release, "Anyone interested in getting their name into the record books will need to provide proof of their highest score. To do this, they will need to video tape their entire game, and bring that video tape along to CGEUK on Saturday 13th August where it will be viewed and verified by officials from Twin Galaxies." Looks like a good collection of games in the third volume of Midway's classic arcade games, packaged and served up for your XBox or PS2 console. Yup, even with all the legal MAME trademark brouhaha going on, a new version of everyone's favorite emulator has been released. Annoucement on MAMEdev.com, binaries to follow on MAME.net. Well, the other shoe has fallen: it appears that the MAMEdev team themselves are taking over for David Foley, and have starting pulling eBay auctions that include the word "MAME" in the title. (VeRO trademark Infringement letter) Enforcing illegal use of the MAME code and illegal ROMs is one thing, but in my opinion this is seriously crossing the line. I'll see if I can't get some answers from the MAMEdev team. Saw a blurb on the Arcade Controls site about Classic Arcade Grafix updating their site, and checked it out. Very nice, and I'm glad to see they're doing well, as they make good stuff (see review). Here's something I found that seems like it might make a pretty good arcade cab encoder: the KeyDog provides 24 inputs along with keyboard ports, but what makes it special is the "watchdog" circuit that monitors the PC for lockups and reboots it if necessary. It's designed primarily for kiosks, but if you want to leave your cab unsupervised, this might be a great way of ensuring guests can always play.